Special thanks to The Gurney Resort Hotel & Residences for extending this food review invitation. The Gurney Resort Hotel & Residences is a 4-star hotel near the eastern end of Gurney Drive (Persiaran Gurney). The hotel's sole eatery, Coffee House, is located on Level 1. Although most diners take the flight of stairs from the lobby, the restaurant is also accessible by elevator. Coffee House hosts its Ramadan buffet dinner every evening from 1 June 2017 to 22 June 2017. The theme this year is "Selera Bazaar Ramadan" (Taste of Ramadan Market). There are 5 sets of menu on daily rotation. It is customary for Muslims to break fast by taking buah kurma (pitted palm dates). Keropok (crackers) and papadum also help to induce appetite. Coffee House's signature item is Chicken Shawarma. Chicken is cooked on a rotating vertical rotisserie with a heating element at the back. As the chicken becomes cooked, it is shaved off layer by layer. Chicken slices are stuffed into the pockets of pita bread in addition to tomato, cucumber, onion, lettuce and garlic mayonnaise. Overall, the chicken is seasoned well and is quite juicy. I also love the soft texture of pita bread. Roasted Lamb Leg remains slightly pink at the center, retaining delectable juiciness to a certain degree. The roasted lamb is also quite tender. Lamb is best enjoyed with black pepper sauce and mushroom sauce. I feel that both sauces are prepared reasonably well. Grilled fish includes tilapia, pari (stingray) and kembung (mackerel). I feel that the tilapia has been cooked for too long, making the flesh drier than how I prefer. Meanwhile for condiments, I recommend that you try the chef's special sauce. Air asam (tamarind sauce) is also prepared. Nasi Tomato (tomato rice) uses long-grain basmati rice. Compared to jasmine rice, basmati rice is fluffier and easier on the mouth. Rice is garnished with raisins, cashew nuts, tomatoes, fried onion and lettuce. The taste is quite satisfying. For poultry, I recommend Ayam Masak Merah (red chicken curry). Pieces of chicken are cooked with spicy red gravy. I think it is better to cut chicken into smaller pieces so that flavoring is more thorough. Sotong Masak Hitam Pedas (squid in dark spicy sauce) is best eaten with rice because its strong taste can be overpowering. I am glad that squid is cooked to the right level of springiness. For something more balanced in flavor, Dalca Sayur (vegetable curry) is a good bet. Made from lentils and a number of spices, the stew is rewarding to be consumed directly. Included in the curry are potatoes, carrots and yardlong beans. Soto is originally an Indonesian recipe but is now commonplace in Malaysia. Coffee House's Sup Soto Ayam (spicy chicken soup) contains bihun (rice vermicelli), potatoes, carrots and chicken pieces. Turmeric is added to give yellow color. Chinese Sweet & Sour Fish Fillet is served with bell peppers, tomatoes and pineapples. I feel that the tilapia is drier than ideal. I personally prefer the fish to have some moisture inside. Penang Char Koay Teow (fried noodle) is stir-fried with egg, garlic chives, chili paste and soy sauce. In my opinion, flat rice noodle is not a good candidate for cooking in large batches because the noodle loses substantial appeal when it is left cold. Instead, rice vermicelli is probably a better candidate. Lam Mee (noodle soup) uses thick gravy which contains shiitake mushrooms and eggs. I feel that the gravy is not flavorful enough. Perhaps having more stock would help. Other ingredients of Lam Mee are yellow noodle, rice vermicelli, shrimps, fishcake, bean sprouts, choy sum and fried egg. Ulam-Ulaman includes raw vegetables like ulam raja (king's salad), daun pegaga (Asiatic pennywort leaves), daun selom (selom leaves), daun kaduk (wild betel leaves), kacang botol (winged beans), bendi (okra) and cucumber. Sambal belacan (spicy shrimp paste) is provided as dipping sauce. As for Jeruk (pickles), popular choices are kedondong (ambarella), pala (nutmeg) and grapes. At the salad section, there are Kerabu Tanghoon (glass noodle salad), Kerabu Kacang Botol (winged beans salad), Acar Jelatah (pineapple and cucumber pickle) and Acar Rampai (cucumber & carrot pickle). Diners who choose to prepare their own salad can help themselves with iceberg lettuce, cherry tomatoes, red cabbage, shredded carrots and salad dressings. Rojak Buah (fruit salad) uses juicy fruits such as jambu batu (guava), sengkuang (jicama), mango, pineapples, jambu air (rose apple) and cucumber. Peanut sauce serves as dressing. Sour plum powder is also provided. I am very impressed with how well the Pandan Chicken turns out. After seasoning with spices, minced chicken is wrapped in pandan leaves and then deep-fried. The chicken is commendable in terms of aroma and taste. Other deep-fried items are Samosa and Spring Rolls. Moving on to desserts, Bubur Kacang Hijau (mung bean soup) is a popular sweet soup with starchy consistency. It is soothing to sip the thick soup towards the end of a meal. Non-soup desserts are Agar-Agar (jelly), Red Velvet, Chocolate Brownie, Apple Crumble and Curry Puff. Should diners prefer traditional Malay kuih, Kuih Talam and Seri Muka are served too. Finally for drinks, orange juice and soy milk are provided in dispensers. As part of the hotel's corporate social responsibility programs, Coffee House invites an orphanage in Permatang Pauh to join the festive feast. Two dozen children are treated dinner during the Ramadan dinner's debut evening. 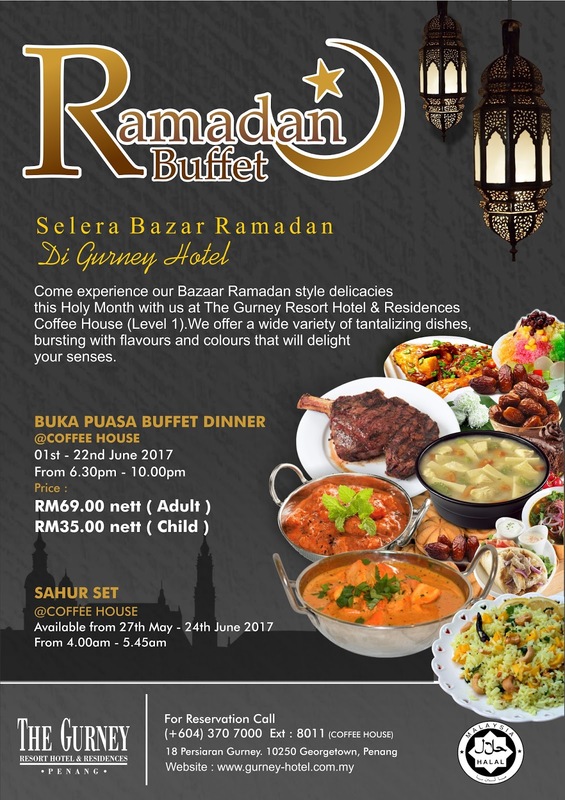 The Gurney's Ramadan buffet dinner is priced at RM69.00 net per adult and RM35.00 net per child. Food is served from 6:30pm to 10:00pm, but Muslims break fast slightly after 7:30pm. Directions: The Gurney is located at the eastern end of Gurney Drive (Persiaran Gurney), just a short distance from Evergreen Laurel Hotel. Coffee House is located at Level 1, right above the lobby. The Gurney provides multi-storey parking for RM6.00 per entry. The parking fee can be deducted from the restaurant's bill, so parking is essentially free. 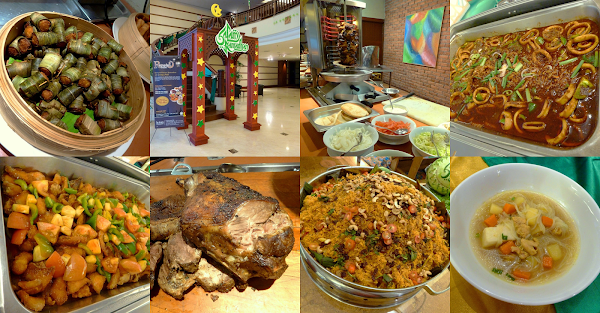 Ramadan Buffet at Gurney Hotel worth to consume as reasonable price with tasty food prepare by chefs.